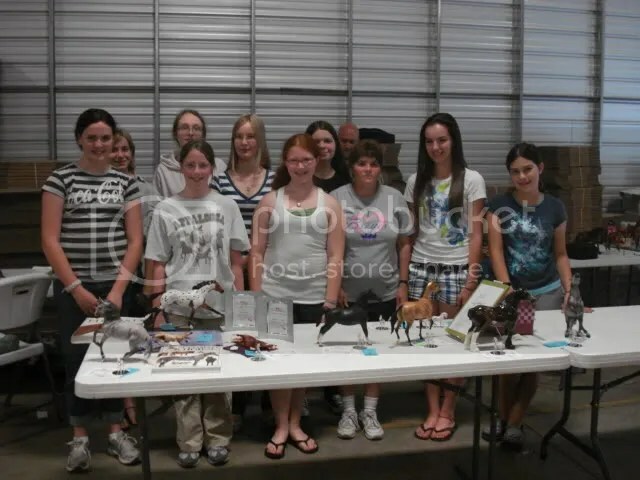 June 26th 2010 marked the second Golden Oak Stables Summer Break Live, a youth and novice model horse show! The Golden Oak Stables warehouse opened its doors to 28 showers and dozens upon dozens of visitors wanting to get a little shopping in and get a piece of the action! The morning started at 10am with performance classes in one arena and Original Finish halter classes in the other. Two judges went to the wire to judge huge classes stuffed with entries worthy of any live show out there. Original Finish Halter classes were exceptionally full with many classes having well over 40 horses entered! With only 10 ribbons to give out for each class, the horses that did receive a ribbon should be proud! 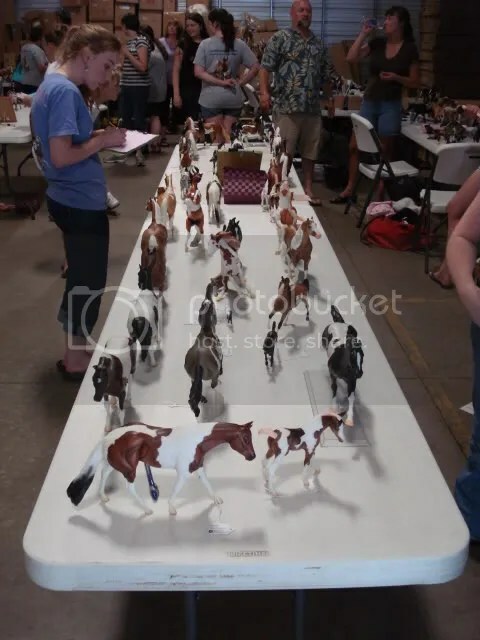 Horses young and old made their way to the ring for Collectibility classes which judged the rarity and desirability of the Breyer horses on the table. These divisions were broken up into classes based on the years made, number produced or where you would have purchased the model at. Owner and Professional custom classes showed the high level of talent that we have in the hobby. Owner custom classes are always a favorite among many, especially the judges at the Golden Oak Stables shows. Seeing what people can create is truly awe inspiring. The New England area has got a wonderful bunch of up and coming customizers on the horizon. Watch out world! At the end of the day, hundreds of ribbons had been awarded and dozens of awards given. The wonderful level of competition was only topped by the smiles and laughter abound! With two more events planned for this year, the Golden Oak Stables calendar is packed with events for just about everyone! August is set for a workshop day with hands on workshops that will send each and every entrant home with projects that they create! October marks the second annual NEFL live, a NAN qualifying model horse show that will welcome all ages and levels of experience! Check the schedule here and mark your calendars! Hope to see you there! 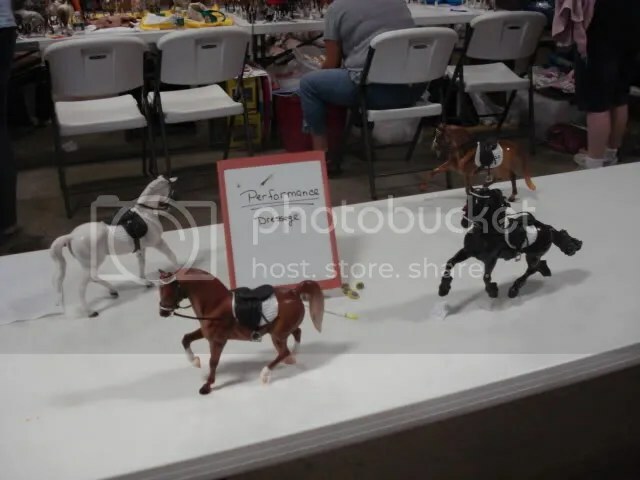 Breyerfest 2010 – Just One Month Away! Excitement is running high as summer has arrived for Breyefest 2010! With less than a month until the big day last minute preparations are being made all around! With a Hollywood theme, Breyer has truly gone out of control with amazing guests for Breyerfest 2010! The guest of honor is Elizabeth Shatner, William Shatner’s wife along with their horse All Glory. The couple are avid horse lovers and their show records prove this! Priscilla Presley will also be on hand to launch the Breyer Elvis line commemorating the horses he loved so dearly. Horse guests are in large supply too for Breyerfest 2010. O’Leary’s Irish Diamond is an Irish Draught horse that has excelled in a myriad of disciplines and is just as beautiful as he is talented. Breyer is no stranger to horse causes and at this year’s Breyerfest Isadora Cruce will be visiting representing the Return To Freedom Sanctuary. The sanctuary works to bring awareness to the issues facing horses. A story of hard work with amazing results lays in Fleetstreet Max and his young owner. The two have even championed their way to 15 world championships! The excitement doesn’t stop at the guests! There are contests and workshops to take part in, many of which are still open for participants. There are also model horse shows for Children, Youths and Adults and word has it that there’s still a bit of room for those last minute entries! Breyerfest is far more than Breyer events though; Lexington, Kentucky is the capital of Horse Country! The Kentucky Horse Park hosts the event and this year is unlike any other before. The park has undergone a multi-million dollar renovation in preparation for the World Equestrian Games taking place this fall and Breyerfest attendees will get some of the first looks at the park! With renovations abound and a brand new coliseum the Kentucky Horse Park will appear much different than in previous years! And don’t forget “A Gift From The Desert” an exhibition at the Kentucky Horse Park with an abundance of artifacts from the Middle East that encompass the life of the Arabian horse. Breyerfest 2010 is gearing up to be a memorable year, and as always, Golden Oak Stables and Stable News will keep you in the know! As collectors its a a reasonable desire to protect your investment. As your collection of Breyer Horses grows, you will likely start to see it as an investment. Collections of any items can grow significantly in size and value extremely quick, but there are a few small things that you can do for your collection to keep their value for years to come. The first step when you get a new Breyer from Golden Oak Stables is to remember to protect it from damage. This starts just as soon as you choose to take the horse out of the box! If you work too quickly or haphazardly you can cause scratches and rubs to your brand new horse! Use a pair of wire clippers or nail clippers to cut the twist ties and very carefully remove the horse being careful not to let the ties scratch against the horse. After you have your Breyer out of the box you’ll want to find a place for it to be displayed that it will not incur damage. One of the largest culprits of damage to Breyers is smoke damage. Keeping your Breyers in a place that they won’t be exposed to smoke will prevent a large amount of any yellowing. You’ll also want to keep them in a place out of direct sunlight that can cause paint fading. Lastly, you’ll want to make sure that they are in a place not exposed to extreme temperatures. Extreme heat and cold can cause seam splitting and warping. Once you have your Breyer displayed you’ll want to be careful not to harm them. Breyers are susceptible to rubs and scratches. Keeping your models displayed and not played with will help them not sustain any rubs or scratches. Be sure not to allow your models to touch on a shelf as this can also cause rubs and scratches. Make sure your horses are displayed on sturdy shelves or cases as well. Shelves do fall and horses do get broken, so be sure that where you choose to display your models is strong and won’t leave you worrying about tumbles. Traveling with your horses or storing them can be a hazard. Be sure that you pack them in clean fabric or bubble wrap. Newspapers and plastic bags have inks on them that can adhere to Breyer plastic. Be sure that you give them enough padding and don’t expose them to a hot car or attic. You’ve taken the time to collect them, so take the time to protect them! A little care can go a very long way when it comes to your collection! A few days before Breyerfest rolls into town, downtown Lexington, Kentucky welcomes the North American Nationals, the pinnacle of model horse showing in North America. This yearly show is the championship show for the vast majority of shows in North America and represents the best of the best of the hobby. In odd years, the North American Nationals, or NAN, is held in a floating location, often on the west coast. 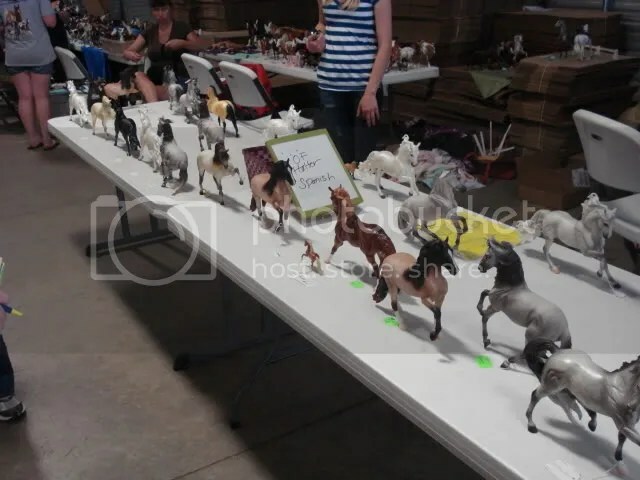 The even years though is when NAN and Breyerfest combine forces to create a week full of model horses! Tuesday, Wednesday an Thursday before Breyerfest is when NAN takes place. It takes over the Heritage Hall in Lexington,Kentucky with its myriad of classes and thousands of horses that are entered. Tuesday at NAN is full of Original Finish Halter Breed classes where the best Breyers in the nation can be found! The horses are judged based on real horse breed standards and are chosen as the most realistic and representative of the breed the shower has chosen to represent that model. Tuesday also is filled with artist resin and custom performance where models are adorned with scale tack and accessories to make the most realistic scene possible. Wednesday is filled out by artist resin and custom workmanship classes. The models are judged on the level of artisanship in the piece and is also host to original finish performance. Thursday is full of original finish collectibility classes where the rarest and most collectible horses are rewarded. The show is finished out on Thursday with china classes, from custom glazed china breed and workmanship to original finish china breed and collectibility! Entry for this year is finished, but you can begin planning for the future. To enter the North American Nationals your model must win first or second place in a NAN qualifying show. These cards are awarded in three colors: green for breed, pink for performance and yellow for collectibility or workmanship. The best part about qualifying your horse for NAN is that you have two years to use the cards so if you can’t make it one year, you have another chance! Even if you can never make it to NAN you can still use your NAN cards for merit awards which you never have to enter or attend NAN to earn! Get a jump on NAN 2011/2012 by attending Golden Oak Stables New England Fall Live in October! Even if you won’t be at NAN, Stable News will be there to bring you all the coverage from NAN and Breyerfest 2010, so stay tuned! Novice Breyer Showing for kids and adults! I’ve widely discussed the many reasons why Breyer horse shows are wonderful events. From education to the thrill of winning, they are events that do nothing but make most enjoy their hobby much more than ever imaginable. For many adults, entering their first live show can be intimidating, as is the choice of which division to enter: Novice or Open? There is no right answer to the above question, as every person is different. Golden Oak Stables shows cater to all, both novices and adults and while the majority of showers are youths, adults are always welcome and in attendance! Many other shows offer both novice and open divisions. Commonly, novice is defined as anyone, regardless of age, who has been showing for less than 2 years or that hasn’t won a Grand Champion title. Other shows do have divisions that are only for youths and adults must show in open. So if you are looking to get into showing and have the opportunity to show in a novice division you may want to take that chance to get your feet wet. 1. You are new to collecting. 2. You do not have a lot of real horse experience. 3. You haven’t been involved in the hobby very long. 4. You have never attended a model horse show. 5. You feel more comfortable giving novice a shot! 1. You have been involved in the hobby for awhile and are familiar with many aspects of the hobby. 2. You are a professional or semi-professional customizer or tack maker and your creations have shown well by someone else. 3. You have lots of real horse experience. 4. You have a lot of general knowledge about horses. 5. You feel like you are ready to jump in! There is no right answer, and no matter what you choose to do, just remember to have fun. Don’t feel intimidated to jump in if you are an adult, you won’t be the first adult to jump in and you certainly won’t be the last. Novice shows are vastly designed to welcome new hobbyists into the world of model horse sowing, no matter what age, but remember competition is the least important thing in model horse showing, its all about having fun! And remember, if you are in the New England area be sure to check out Golden Oak Stables shows! Breyer Horse 2010 Mid-Year Releases! It’s that wonderful time of the year, just before Breyerfest when the mid-year releases are announced! This year had an exceptional line of horses for the beginning of the new year and the mid-year releases might just be even more exciting than the first batch! From the perfect pony for the younger generation of horse lovers, to items for the Elvis lover in all of us, the mid-year runs are enough to get just about anyone excited about collecting! The famous equestrian, McLain Ward, has been burning up the show circuit on his faithful mount Sapphire. Created on the Gem Twist mold, Sapphire is a beautiful horse with amazing detailing and looks ready to gallop right off into the arena! Speaking of champions, the champion New Forest Pony, Enchanted Forest has been created on the Newsworthy mold as a compact little jumping pony. This champion hunter pony has garnered success just about everywhere he’s attended! Breyer’s new line of the horses of the “King” Elvis Presley will be released this fall and it is already full of variety and beauty. The first traditional replica of Elvis’ faithful mounts is Rising Sun. This palomino beauty is done on the Stock Horse Stallion complete with the new revised long tail. Rising Sun has also been created in a resin with his faithful rider Elvis. Standing on a Clef Note in pure musical style, this beautiful resin is a wonderful representation of the “King”. 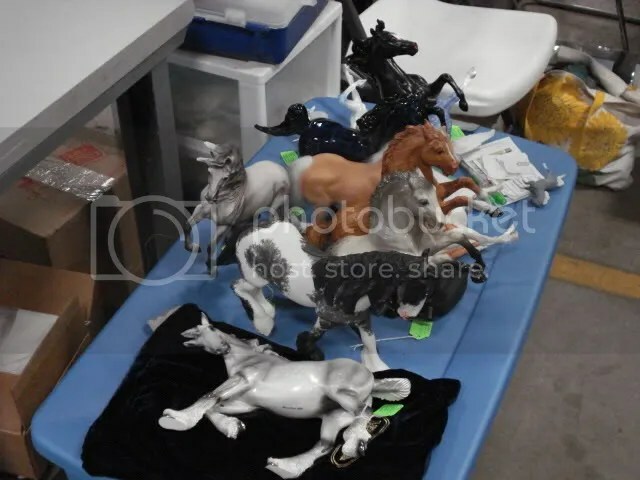 If you have play in mind, there is also a line of plush horses that represent Elvis’s mounts along with a set of four stablemates and a stablemate playset of the Graceland barn! What about a Breyer for the younger person in your life? Jasmine Color Surprise Bath Toy is a beautiful and realistic take on a toy horse that has all the accessories and features to enchant just about any young horse lover. With color changing hair and spots, as well as a bath robe and slippers, she’s bound to entertain for hours! Chloe’s Care For Me Vet Set is the perfect toy for that aspiring veterinarian or someone who just likes to care for animals, with a ton of accessories, your little one can cure just about anything that Chloe might get herself into! And that’s not all! There are still many more exciting releases for the middle of the year! Take a look today and don’t forget to pre-order them so you can have them on your door step as quickly as possible! Getting Creative With Your Breyer Horses! We all have a special talent, and we all have a bit of creativity that we can uncover. Its easy to see the craftsmanship, talent, and effort that goes into creating a Breyer Horse, from sculpture, to molding, to painting, the levels are beyond compare! But have you ever wanted to try for yourself? What about that beautiful tack that’s available for your horses; why not give that a shot? Its all possible with just a little creativity! Many hobbyists are aware that there are hundreds of custom Breyer customizers that repaint Breyers into a myriad of colors, but beyond that there are many other things that can be created in the hobby. Repainting Breyers are just the tip of the iceberg. There are hundreds of artists that reposition and resculpt models and change them so drastically that they are virtually unrecognizable. Arabians can be turned into mustangs and a fancy show horse could be turned into a work horse – the only limit is the imagination. Some hobby artists paint beautiful “Decorator” horses that are painted not to be realistic, but to be fanciful and push beyond the limits of reality. From rainbows to unicorns, decorators can be just about anything that can be imagined! The other large area in the Breyer Horse hobby is tack and prop making. Some artists create scale size miniature tack that can even be museum quality. Many of these look exactly like their real size counterparts and can be sized anywhere from Tradional scale to Micro Mini where the tack is smaller than your smallest fingernail! There is also a very popular group of artists who create scale props of anything from a feed bucket to a trail bridge. Making scale props is an exceedingly difficult task and good propmakers are hard to come by, they are some of the most scarce artists in the hobby. No matter what you might think you are good at, give everything a try! Start big and let your imagination run wild! Golden Oak Stables is there to give you a head start from the pack with a ton of different activity kits which are affordable and have all the materials you need for any number of projects, start one today. You are currently browsing the Stable News blog archives for June, 2010.